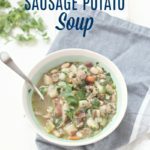 This hearty sausage potato soup is a delicious, healthy, high protein meal that will satisfy on a cold, chilly night… or anytime, really, if you’re a soup lover like me. Soup = life in my book! My husband, on the other hand, dislikes soup because he complains he is still hungry after eating it. 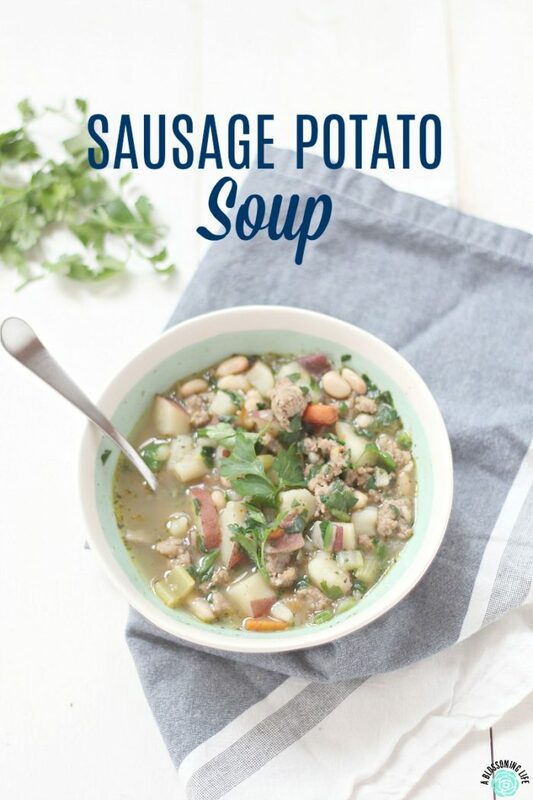 Not with this hearty sausage potato soup. 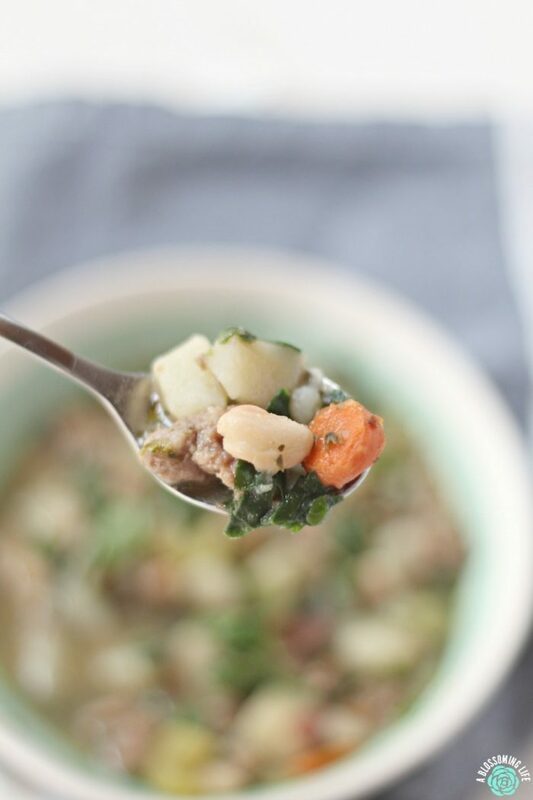 Between the potatoes, beans, and lots of veggies, it’s thickness will fill even the hungriest of bellies. Pair that with good’ole crusty bread and butter and you have a winner. Plus, it comes together in no time, especially if you have an Instant Pot . Don’t have an Instant Pot ? No worries! I’ve actually made this soup lots of times in a dutch oven or big soup pot. This was actually the first time I tried it in an Instant Pot. So, below I will include the instant pot recipe and the classic version. On another note, I’m really getting into this food video thing. It is super fun, and I love everything about it (except the prep and dishes, which are tedious). I’m a messy cook and having to make everything and separate it into bowls is the one downside. But since everything else is so fun, it makes up for it. I created this video during nap time, and it literally felt like I was racing against the clock. By the time the Instant Pot came to pressure and the clock was ticking, I was just hoping and praying that it would be finished before the kids woke up. As the clock hit two minutes, I could hear the baby stirring, and by one minute, it was full blown screams. Of course, I don’t want him to wake up his sister, so I rushed in to swoop him in my arms and the rest of the video and pictures were taken with him right next to the set. It was sweet. So, please excuse my not absolutely perfect pictures. The cute baby was gurgling and distracting me with his adorable giggles. I blame him. Then, “Again, again?” I think we watched it 190 times, so I was done watching it for a while. But hey, it kept her entertained as we tried to get ready for church. 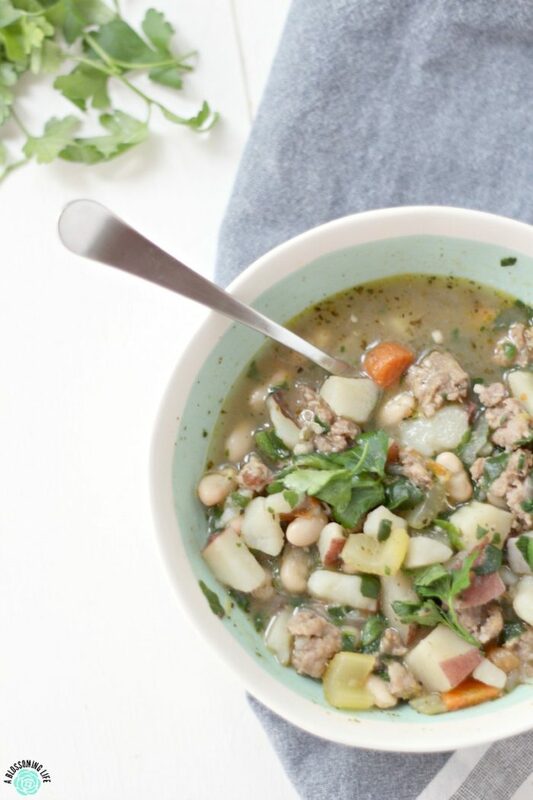 This hearty sausage potato soup is a delicious, healthy, and high protein meal that will satisfy on a cold chilly night... or anytime if you're a soup lover during any season. salt and pepper to taste I add lots of salt because salty soup is my favorite. Set Instant Pot to sauté. Add oil and sausage and brown sausage. Remove sausage and set on a clean plate. Add in carrots, celery, and onion and sauce for a few minutes. Add potatoes, broth, water, salt, pepper, and seasonings. Close lid, making sure the valve is set to sealed. Set to manual, high pressure for 10 minutes. Once the timer goes off quick release the valve open and set to sauté again. Add spinach and beans. Allow to come to a boil and enjoy. In a large pot over medium heat add oil and sausage. Cook until sausage is browned and place on a clean plate. Add in carrots, celery, and onion and sauté for a few minutes. Add potatoes, broth, water, salt, pepper, and seasonings, bring to a low boil. Boil for about 10-20 minutes until potatoes are soft. Add spinach and beans. Allow to come back to a boil and enjoy. What is your favorite kind of soup? Mine is Minestrone! Thank Matt! Hope you enjoyed it!